Specializes in barcode data collection applications and automotive EDI for Epicor Software solutions, including Manage 2000 and Vantage ERP systems. Located in Newmarket, Ontario, Canada. Advanced Automation provides products, service and consulting for barcoding and automatic data collection systems. Distributor of DataCad software for architectural, manufacturing, and mechanical design products. Designs, manufactures, markets and distributes computer connectivity and networking products, such as cables, connectors, installation products, data sharing devices and interface cards, transceivers and repeaters for different networking topologies. Products and Technologies for OpenPGP and S/MIME integration for corporate use. Advanced client products for Microsoft Outlook, Lotus Notes, Hard Disk Encryption and others. PKI Technology for CA/RA integration of PGP and X.509. Advanced File Replication and Management Products based on Peer to Peer Technology. Provides java based products for scalable file distribution solutions. Sells LCD projectors and plasma displays. Developer of PhotoModeler software products advanced 3D measurement and imaging technology. Features printer, fax, copier, multifunction, and shredder products. An advanced hex editor and disassembler. News, support and related products such as language packs, plugins and add-ins. Designs, develops, and manufactures ADvanced TRANsmission products for high-speed digital communications. Offers computer systems, hardware, software, monitors, UPS backups, networking products, and accessories. Designs and manufactures advanced home automation products components utilizing power line carrier technology. Develops and manufactures advanced transmission products for high-speed digital communications used by telephone companies and corporations. Offers a broad range of tape automation, storage networking, and software products. Information about current products including Advanced Bughound, FAQ Builder, and Cool Notes utilities. Developer offers a group of specialized products for the vehicle leasing and finance industries. Features FAQ and downloads. Products include Advanced Direct Remailer. A bulk mailer with an internal multithreaded SMTP server and database interaction capabilities. Accounting software for the heavy/highway/utility construction and material production industries. Products, services, news, training. Services include web development utilizing PHP, CGI and Flash and offers advanced products such as multimedia applications, kiosks, games and school annuals. A set of software products to develop and manage high-performance web sites for advanced e-business applications. Develops, manufactures and markets innovative and advanced microprocessor-controlled remote management and remote control products. Provides various advanced products based on OPC technology or related to it, with a focus on OPC Server development, OPC Client development, and custom OPC solutions. Provides advanced communications software and services to integrate MultiValue/Pick database applications with other products and technologies. Located in Mission Viejo, California, USA. Blog with advanced Java code samples, configuration and optimization tips for Java/J2EE related products. If the business hours of Manufacturing Systems Corp in may vary on holidays like Valentine’s Day, Washington’s Birthday, St. Patrick’s Day, Easter, Easter eve and Mother’s day. We display standard opening hours and price ranges in our profile site. We recommend to check out mfgsyscorp.com for further information. 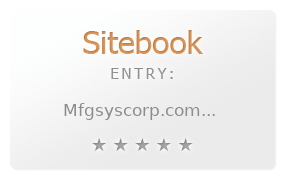 You can also search for Alternatives for mfgsyscorp.com on our Review Site Sitebook.org All trademarks are the property of their respective owners. If we should delete this entry, please send us a short E-Mail.